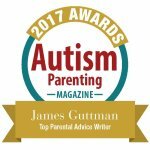 Autism Parents Are Just People – Hi Blog! I'm Dad. I didn’t need to take a test to be a parent. No one made me fill out a questionnaire or pass a background check. I actually had to jump through more hoops to get my library card than I did to have a kid. Not only that, but I also didn’t need to do anything to become an “Autism Parent”. It was the same routine for my son, who is non-verbal and on the spectrum, as it was for my daughter, who is non-stop verbal and not on the spectrum. I simply became a dad. Everything that came after was part of the experience. That doesn’t stop others from making reverent generalizations about the parents of children with Autism or any special needs though. The idea is that we’re special or “super“ in some way. The mere fact that we are there for our children, who might require different care than others, is enough to elevate us to a pedestal that doesn’t always feel appropriate. I was reminded of this while watching a cable drama a few months back. In order to avoid spoilers, I won’t tell you the character or show. The gist, though, was that our star, fresh out of prison, was having confusing flashbacks of being tortured by an unhinged guard. Throughout the unfolding saga, the audience is left wondering if the memories are real or simply manifestations of the man’s madness. Upon his release, our main character heads straight for his alleged antagonist’s home. As he arrives, a young boy answers the door. Without making eye contact, the child demonstrates many stereotypical signs of Autism and speaks in very few words. When he becomes upset over the man’s presence at his doorstep, the boy is comforted by the possibly torturous security guard – shockingly revealed to be his father. Which, by the way, is complete nonsense. Look, I’m going to be honest here. I don’t torture people, but that’s not because I have a non-verbal child with Autism. It’s because I know I’m not supposed to torture people. The two aren’t mutually exclusive. I know plenty of parents who love their children…and who I can also totally picture torturing people. If I’m going to be frank, I see my care for Lucas as an almost selfish thing. I don’t consider it doing a good deed or generating positive karma. He’s my son. I made him. He’s a part of me. Any good I do for him, I do for me. Even if you take the biological aspect away from it, an Autism parent’s child – whether by birth or other circumstances – is still their child. There’s no need for applause. It’s not “babysitting” when it’s your own kid. It’s life. What I do for Lucas is because I love him and I’m responsible for his happiness as any parent would be for any of their children. Not just that, but I chose to bring him into my life. He didn’t mail us a telegram asking to be born or send a friend request to join our family. We decided. We brought him here. So being there for him is just part of the whole family thing. Making sure that he feels safe and cared for is the same responsibility that I have for my daughter and my wife. Heck, you can even throw our cats into that group too. No one is calling me a “hero” for petting them even when I’d rather be left alone to watch TV. We’re a family. Caring for a child with Autism or any other special needs does require different attention and, while I appreciate that people might realize that, I don’t think it makes me someone unique or super human. I don’t need applause. To be honest, if anything, I just need understanding at times. I need people to understand if we’re late to a function or if I have to leave early with my son. I need them to see that we can’t always go to the events we wish we could go to or drag him to the boring grown-up things that other children could quietly sit through with a picture book. It’s more helpful for people to understand those things rather than admiring me for doing them. And, honestly, I say “need”, but I don’t even need people to understand those things. To put it bluntly, I don’t need anything. I’m parenting just like everyone else. No more, no less. Can the responsibility of caring for a special needs child soften or change someone? Sure. Are there people who can alter their view of the world through this experience? Absolutely. Does having a child with Autism automatically make someone an angelic gift of patience to the world? No. No it doesn’t. As parents, we make promises to the universe that we’ll keep our kids safe and love them unconditionally. Your child doesn’t have to have Autism in order to produce stressful and frustrating moments for you. Kids can wrap you up in knots whether they’re on the spectrum or not. It’s the type of thing they’d make you pass on a test before letting you have kids…if they did that sort of thing. But they don’t. You have kids. You love your kids. Autism or not, that’s what real parents do. Any parent can become an Autism parent. When the time comes, they step up to the plate as best they can and love their child with all the enthusiasm they can muster. If they can’t do that, then Autism was never the issue. It just means they never were a real parent to begin with.